Tarantulas live on every continent except Antarctica. In the U.S., they’re found within several different states, mainly in the Southwest. They thrive throughout the world, with the highest concentrations in Mexico, South America, Africa, and Asia, as the map below suggests. Tarantulas generally prefer warmer climates that have moderate to high humidity—very few are found in dry deserts. Are you ready to learn where your pet tarantula came from originally? The United States is home to over 50 species of tarantula, some of which aren’t even described by science. Tarantulas live in twelve U.S. states, including New Mexico, California, Arizona, Louisiana, Texas, Arkansas, Nevada, Utah, Colorado, Oklahoma, Kansas, and Missouri. Florida does have some introduced species (non-native, most likely hitchhikers on shipments from other countries), including Brachypelma vagans. They’re by and large harmless, and usually seen during breeding season when males come out of their burrows to search for females. The most numerous family is Aphonopelma. Once in a while they migrate across roads in large numbers, triggered by rains during the breeding season. If you’re looking for one, it’s best to do so at night during Spring and early Summer after the rains arrive. When it’s hot and dry out, they’re usually deep underground. Watch for silk on the ground, which means you’ve found the entrance to their burrow. 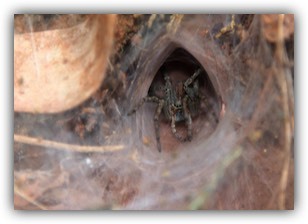 Here’s a tarantulas at the entrance to its burrow. 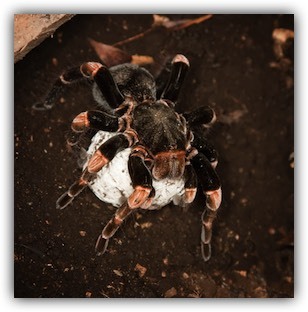 Mexico is home to some of the most beloved tarantulas in the world, including 14 Brachypelma species. This would include popular species such as the Mexican fireleg, the Mexican redknee, and the curlyhair, among others. Most species of tarantula living in Mexico are of the genus Aphonopelma, just like in the United States. There are 66 known species in all, making Mexico the country with the second most known tarantula species in the world. Interestingly, Brachypelma tarantulas are the only tarantulas worldwide that are CITES listed animals, which means there are exportation quotas and restrictions for these species. Tarantulas live in every South American country, so it’s really a hot-bed of arachnid activity. They’ve got everything from dwarfs to giants, and everything in between. Chile has the ever popular Rose hairs, Brazil has the Giant salmons and whiteknees, Guyana has Pinktoes and Goliaths, Peru has the Purple pinktoes, Venezuela has Greenbottle blues, and so forth. Many of the most sought-after species occur within South America. Europe isn’t home to many tarantulas, mainly due to the moderate climate. There are four known species in Spain, and a single species in Italy. None of them are very commonly seen. Asia is home to some impressive Old World tarantulas, including species such as the Cobalt blue (Haplopelma lividum) and the Chinese bird spider (Haplopelma schmidti). The Asian species tend to be a little more aggressive and flighty than the rest, but at least they don’t have urticating hairs. There are no known tarantulas in Japan. India has some of the coolest tarantulas in my opinion, chief among them being the Gooty Sapphire (Poecilotheria metallica). 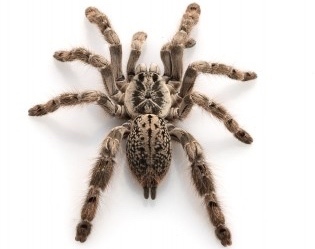 The Poecilotheria tarantulas are known as having a more potent venom than most other tarantulas. Many different species of tarantula live on the continent of Africa, the most notorious among them being the Baboon tarantulas. This list would include the Starburst baboon (one of the meanest tarantulas in the world), the King baboon (another very aggressive species), and the Ornamental baboon (yep, you guessed it, another defensive spider). There is one very sought-after spider called Augacephalus junodi, but it’s rarely seen within the hobby. You can see now that tarantulas live across much of the planet, even in places you probably never expected. That’s the thing about tarantulas—they generally keep to themselves and avoid humans as much as possible. If you want to find them, you usually have to look for them deliberately. In the wild they live in burrows, under flat rocks and debris, and even in tree bark crevices. In my experience, most of their life is spent hiding and waiting—tarantulas don’t go looking for trouble. If you’re lucky, you might find a few burrows laden with silk, or a wandering eight-legged friend looking for a meal or a mate. egg sac full of future spiderlings.